Intrathoracic migration of ventriculoperitoneal shunt is a rare complication and usually complicated with pneumonia or cerebrospinal fluid hydrothorax, which leads to diagnosis and early interventions. Very rarely patient remains asymptomatic. Here is a case report of a 6-year-old boy with a rare asymptomatic intrathoracic migration of ventriculoperitoneal shunt. Ventriculoperitoneal (VP) shunt is a common procedure performed for hydrocephalus. Complications such as shunt migration may be secondary to infection, local inflammation, or incorrect tunneling.,,,, Till date, 27 cases have been reported for intrathoracic migration but all of them were associated with complications such as pneumonia, hydrothorax, and respiratory distress., However, asymptomatic presentations have been rare and also case reports of intrathoracic migration in children are few. Our purpose of presenting this case report was to highlight an early diagnosis of rare migration by simple investigation and prevent major complication and mortality. A 6-year-old boy reported to our outpatient department (OPD) as a follow-up case of hydrocephalus with dorsal meningocele with complaints of mild, intermittent chest pain for 1 month. He did not have any fever or dyspnea. He underwent VP shunt procedure with a medium-pressure flexible shunt and repair of dorsal meningocele at 1 month of age and was doing well till date. He was followed up at our OPD every 6 months and was asymptomatic. Clinically, the VP shunt chamber could be palpated in the neck as it was shifted down. His vitals were stable, chest was clear, abdomen was soft, and there was no neurological deficit. His weight gain and height was appropriate for age. Routine blood investigations and chest X-ray were carried out. Blood reports of complete blood count and electrolytes were normal. The anteroposterior (AP) and lateral view of chest X-ray revealed supradiaphragmatic coiling of VP shunt in the right side of chest wall. There was no pleural effusion or hydrothorax [Figure 1]. Non contrast CT scan (NCCT) thorax was carried out to confirm migration of the VP shunt in the thoracic cavity [Figure 2]. NCCT of brain revealed downward migration of VP shunt outside lateral ventricle. Initially, a neck incision was made to retrieve the shunt; however, because of failed attempt, video-assisted thoracoscopic removal of shunt was carried out and it was retrieved totally. 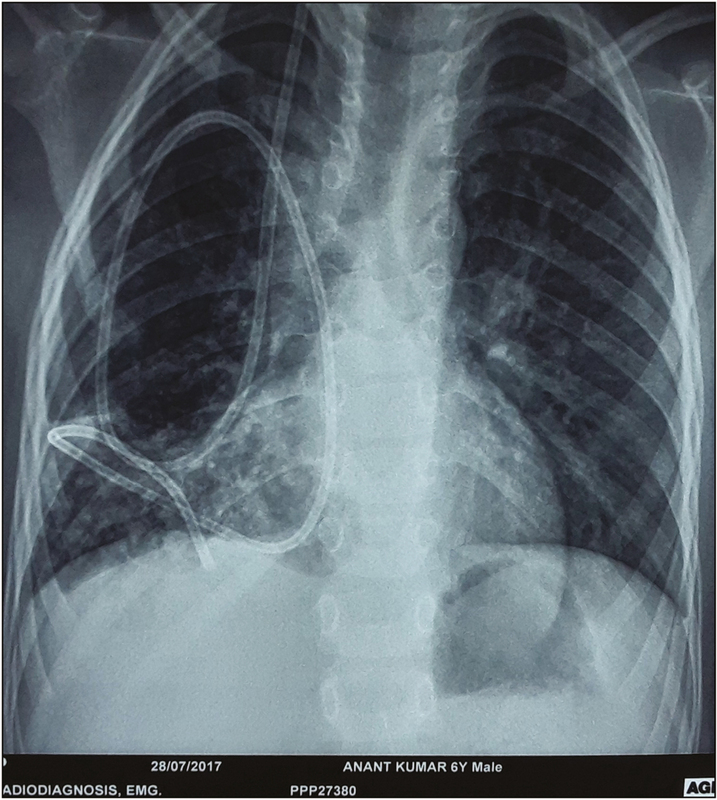 Intrathoracic migration of VP shunt is very rare and may present with serious complications secondary to pneumonia or hydrothorax., In children, cases have been reported with severe respiratory distress and fever following intrathoracic migration. Hence, such a condition must not be neglected. In our case, the patient had only mild and intermittent chest pain with no other symptoms for 1 month, which could be probably because of the catheter being in the subcutaneous level. Only a high degree of suspicion with a plain chest X-ray helped us to evaluate the case. Taub and Lavyne have classified three types of thoracic complication: (a) due to intrathoracic trauma during subcutaneous tunneling in supradiaphragmatic or transdiaphragmatic migration, (b) migration through asymptomatic congenital hiatus in the diaphragm (foramen of Bochdalek and Morgagni), and (c) erosion of the diaphragm as a result of local inflammation. Nazaroğlu et al. stated in his rare case report of migration of VP shunt that in imaging distal portion of the shunt is seen coiled within the chest without any part of the shunt lying below the diaphragm in supradiaphragmatic migration and tip of the shunt could not have migrated through an opening in the diaphragm in such case. Rahimi Rad et al. reported incorrect tunneling as the cause of supradiaphragmatic migration, but presentation was immediately after surgery. In our case, the child remained asymptomatic for 5 years, hence it was unlikely to be a procedure failure. However, downward migration of VP shunt from ventricle may be age related as the patient was shunted at 1 month of age or because of local inflammation around the shunt and the underlying chest wall, which might have caused erosions of the parietal pleura and also disrupted the anchoring effect of the catheter leading to migration into the thoracic cavity. Karapolat et al. 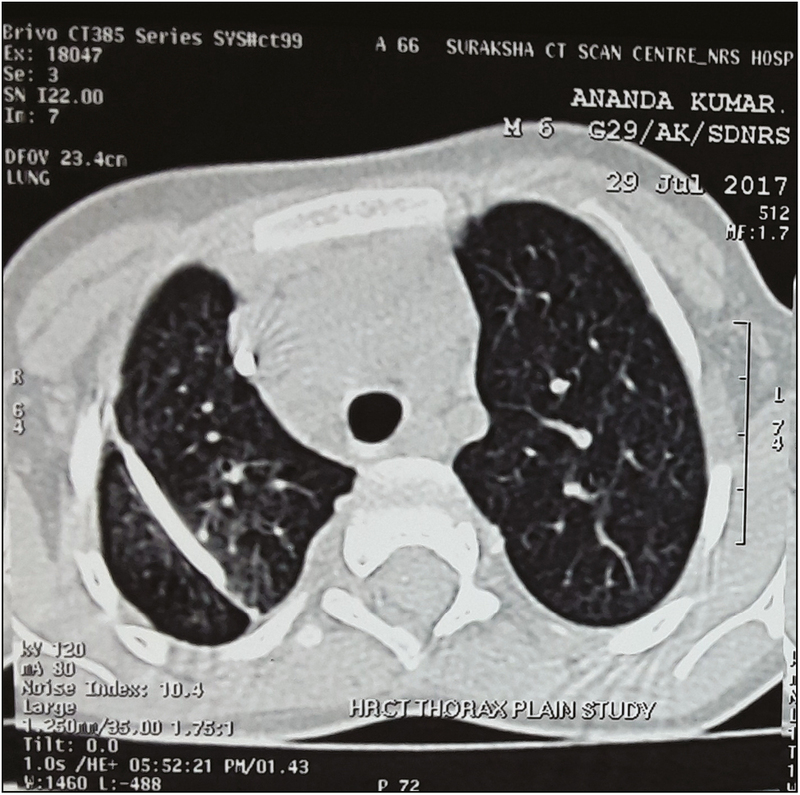 reported a case of intrathoracic migration of VP shunt in a 7-year-old child with pneumonia and stressed on the removal of the shunt as the main method of treatment. Dabbah et al. reported three cases—one child and two adults of intrathoracic migration presenting with fever and dyspnea. He highlighted that this condition is potentially serious in children and needs urgent intervention as compared to adults. Intrathoracic migration of VP shunt is a rare complication and should not be overlooked in a follow-up patient of VP shunt with any respiratory symptoms. Simple investigation helps us prevent potentially serious complications and mortality. Hence, a high degree of suspicion should always be present for patients on VP shunt. Doh JW, Bae HG, Lee KS, Yun IG, Byun BJ. Hydrothorax from intrathoracic migration of a ventriculoperitoneal shunt catheter. Surg Neurol 1995;13:340-3. Borkar SA, Satyarthee GD, Khan RN, Sharma BS, Mahapatra AK. Spontaneous extrusion of migrated ventriculoperitoneal shunt catheter through chest wall: a case report. Turk Neurosurg 2008;13:95-8. Nazaroğlu H, Ozkan U, Ozmen CA, Akay HO. Migration of ventriculoperitoneal shunt into the lung by passing through the liver and the diaphragm. Diagn Interv Radiol 2009;13:19-21. Karapolat S, Onen A, Sanli A. Intrathoracic migration of ventriculoperitoneal shunt: a case report. Cases J 2008;13:42. Anegawa S, Yoshida M, Kuramoto S, Ohmori Y. [Migration of ventriculo-peritoneal shunt into the chest. Case report]. Neurol Med Chir (Tokyo) 1986;13:256-61. Rahimi Rad MH, Mirzaagazadeh J, Ansarin K. Supradiaphragmatic and transdiaphragmatic intrathoracic migration of a ventriculoperitoneal shunt catheter. Hong Kong Med J 2007;13:147-9. Dabbah H, Guilburd JN, Guralnik L, Soudack M, Nun AB, Bentur L. Delayed diagnosis of pleural complications in ventriculoperitoneal shunt—case reports of three patients. Respir Med Extra 2006;13:92-4. Taub E, Lavyne MH. Thoracic complications of ventriculoperitoneal shunts: case report and review of the literature. Neurosurgery 1994;13:181-3; discussion 183-4.